Ceylon Tea received a much needed boost in USA, the fourth largest importer of tea in the world, after Russia, UK and Pakistan, when Sri Lanka Tea Board successfully organised two mega tea promotional events in Las Vegas, USA last week. Sri Lanka Tea Board and seven tea companies participated at the "World Tea Expo" the most prestigious specialty tea exhibition of USA, held at Mandalaya Bay Convention Centre in Las Vegas from May 30 to June 1. The main objective of the World Tea Expo is to provide best tools available for the participants to expand their business professionally. The organisers had created many new features for this year's event than in any year in the past to provide a total package for development of the tea industry in USA. The most significant new offering was the educational programmes targeted at new entrepreneurs in the tea industry. Skill building workshops, Iced and Hot tea competitions and World Tea Championship were the other major features of the World Tea Expo fair. 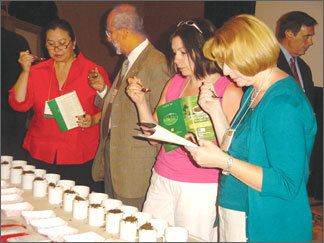 World Tea Expo is the only business to business Convention in North America. It showcased more than 400 tea related companies including tea manufactures, importers, exporters and other related organisations from across the USA and 39 other nations. Over 5000 national and international buyers and industry professionals visited the 2008 event. Around 45 seminars of various topics on business of tea, global policies and future of tea industry were conducted at the event. USA is the most unique tea market in the world as they consume more iced tea than hot tea. The Ready-to-Drink (RTD) ice tea sector, with tea in pet bottles or tetra packs, account for about 80% of retail tea sales in USA. The tea industry remains vibrant with domestic companies reporting sales growth and new entrepreneurs and new tea products entering the market place. Tea imports to USA have shown a significant growth during the last six year period. USA tea imports have moved up from 96,668 mt in 2001 up to 113,651 mt by 2007, registering a growth rate of almost 18% during the six year period. At the current pace of growth, tea sales in USA will certainly exceed US$ 10 billion in about three years time from the current level of US$ 6 billion. The enhanced demand for Green tea, due to its health benefits, Ready-to-Drink tea products and specialty tea products have been the driving force behind this impressive growth in the USA tea market. The main focus of Sri Lanka participation at the World Tea Expo event was on the specialty tea segment. Teas from seven agro-climatic regions of Nuwara Eliya, Dimbula, Uva, Uda Pussellawa, Kandy, Ruhuna and Sabaragamuwa and also Ceylon Green tea, Organic tea and single origin garden mark tea etc. were promoted at the event. Stassen Exports, Mackwoods Tea. A.F. Jones Exports, Bio-Tea Company, Ceylon Royal Tea, Tea Trends and Lumbini Tea Factory were the Sri Lankan tea companies who directly promoted Ceylon tea products at the World Tea Expo. Three other Sri Lankan companies - Expo Lanka Tea, Bogawantalawa Plantation and Lanka Organics jointly with their Agents in USA also promoted Ceylon Tea in iced and hot tea categories at World Tea Expo fair. All Sri Lankan participants have met new potential buyers, established contacts with USA and Canada retail trade members and looking forward to enhance their presence in the North American tea market. Sri Lanka exports around 3500 mt of tea to USA annually of which about 55% are in pre-packed form. The foreign exchange earnings received from tea exports to USA reached Rs. 1929 million in 2007, an increase of Rs. 117 million over the revenue of Rs.1812 million recorded for 2006. Sri Lanka's participation at World Tea Expo will further strengthen Ceylon Tea position in the USA market and will also bring more foreign exchange to the country. With the assistance of USA Tea Association and Sri Lanka Embassy in Washington DC, Sri Lanka Tea Board organised a Ceylon Specialty Estate Tea of the Year competition for North America at the Mandalay Bay Conference Centre in Las Vegas on June 1, 2008. The main objective of this contest was to popularise Specialty Ceylon Estate tea among the USA and Canadian trade members and consumers. 48 Final Entries selected from 410 applicants, were tasted and evaluated by a Panel of Judges comprising of six USA Tea Trade members and two Canadian Tea Tasters. The samples represented seven agro climatic regions of Sri Lanka namely, Nuwara Eliya, Dimbula, Uva, Uda Pussellawa, Kandy, Ruhuna, Sabaragamuwa and Green Tea. A winner and runner-up from each sector were selected by the Panel. While the tasting and evaluation were taking place a presentation on Ceylon Tea covering its history, present market condition, why Sri Lanka is ahead of other tea producing countries was conducted by President, Asia Siyaka Commodities Ltd Anil Cooke. The foreign participants were not only able to listen to the presentation but also got the opportunity to taste Specialty Ceylon Tea from all seven regions. Managing Director of Euro-Scan Exports Anselm Perera and Director of Akbar Brothers Joseph Sinniah, explained to the members of media and foreign tea trade the art of tea tasting and how a good tea can be identified. New Vithana Kande tea factory was selected as the overall winner of Low Grown tea category and Saint James tea factory was the overall winner of High Grown tea category. A Charity Tea Auction of the overall winning teas was conducted at this competition in order to generate more publicity for Ceylon Tea in the USA market. All proceeds, less costs, will be donated to Tsunami affected children in Sri Lanka by the USA Tea Association. It was fascinated to witness that a kilo of new Vithana Kande tea was sold for Rs. 7000 (US$ 70/-) while Saint James tea got Rs.2200/- (US$ 22/-) per kg at the Charity Tea Auction. This was a historical moment as it was the first Auction of Ceylon Tea held in the USA territory. The balance winning teas would be auctioned in Colombo, at a special Tea Auction organised by Colombo Tea Traders' Association. President of USA Tea Association, Joseph Simrany, President of Tea Association of Canada and Mrs. Louise Roberge, Chairman, Sri Lanka Tea Board Lalith Hettiarachchi graced the occasion which was patronised by many media personnel representing both print and electronic media.